Our journey exploring the connection between wine and art continues. This time we are going to speak about painting. Since very remote times wine has been a source of inspiration for the greatest painters. It has been presented in its different nuances: moments of harvest, of conviviality, as a mythological and sacred element, in portraits. In this article we are going to examine few of the numerous examples, without following a chronological order, but dividing the paintings according to their topic. 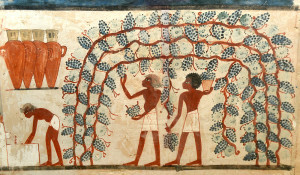 In order to give an idea of the long timeframe during which wine has been a subject of painting, it is enough to mention the burial paintings of the Ancient Egyptians depicting a harvest. One of the oldest and most significant examples is the tomb of Nakht in Sheikh Abd el-Qurna, dated back to 1380 A.C.
Let’s make now a jump of about 3milleniums discovering that it is again the harvest the “ subject of inspiration” this time of one of the greatest painters, Vincent Van Gogh. 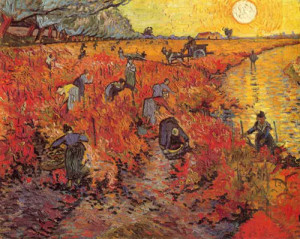 In his painting “The red vineyard” the artist paints a harvest day in the area of Arles, where he used to live for a certain period in 1888. There are two curiosities around this painting: it was the only one sold while Van Gogh was still alive and it is also the only one that the artist created “by memory” without having the depicted object in front of his eyes. Between 17th and 18th century wine was mostly presented in paintings in the moment of its “consumption” – as a protagonist of feasts, dinners, bacchanalias. 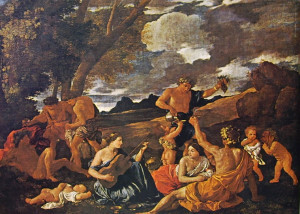 In 1627 the French painter Nicolas Poussin painted his “Bacchanalia with a lute player” (today in the Louvre in Paris). The theme of this painting seems to come from “Filostrato” – it is evoked the island of Andros, where following Bacchus desires wine was floating in abundance. This artwork is a further testimony of the strong relationship between wine, music and conviviality in the life of Ancient Greece. As long as it concerns portraits, there are many presenting Bacchus. 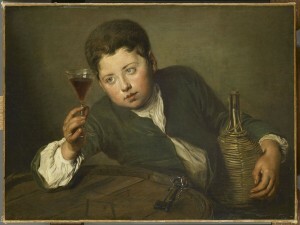 Another very famous portrait connected with wine is “The young drinker ” of the French artist Philippe Mercier (1689-1760). Since its very first expressions, Christian art confirms the mystical meaning of wine. 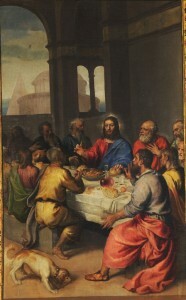 In the New Testament wine is presented in the story of the Marriage of Cana and in the Last Dinner. Wine has been depicted in the paintings of important Christian artists along the centuries many times. One of the most significant examples is “The last dinner” of Tiziano Vecellio (1542-1544).